Lazar Markovic and Sam Clucas struck second-half goals as 10-man Hull kept their Premier League survival hopes alive with a gutsy 2-0 home win against Watford. The Tigers overcame the controversial first-half dismissal of striker Oumar Niasse to score two brilliant goals in the space of nine minutes just after the hour mark through Markovic and Clucas to stay two points clear of the relegation zone with four games to play. Hull's bid for survival had been dealt a massive blow when referee Robert Madley showed Niasse a harsh straight red card in the 25th minute, but their 10 men showed real fight after the break and stormed to a sixth win in seven home league games under head coach Marco Silva. Silva's side made their usual jittery start, but settled after early Watford pressure and created their first opening in the 15th minute when Clucas fired over the crossbar from the edge of the penalty area. Watford, all but safe on 40 points, were well organised but showed little intent to take the game to their hosts and the pattern appeared set, with Hull probing patiently in search of an early breakthrough. But all that was turned on its head in the 25th minute when, to the disbelief of the home crowd, referee Madley produced a straight red card for apparent dangerous play after Niasse's challenge on M'Baye Niang. Niasse appeared to catch Niang on the shin as they challenged for the ball in midfield, but television replays showed there had clearly been no upturned studs and Madley's decision to send the striker off was harsh in the least. Watford took full advantage, stepping on to the front foot to threaten on several occasions before the break. Centre-half Sebastien Prodl's header was brilliantly turned over the crossbar by Hull goalkeeper Eldin Jakupovic, Nordin Amrabat's shot was blocked by Alfred N'Diaye and Miguel Britos headed Tom Cleverley's cross wide. Hull survived, further aggrieved after appeals for a foul on Grosicki in the penalty area had fallen on deaf ears, and Madley, surrounded by stewards, left the field to raucous boos at half-time. 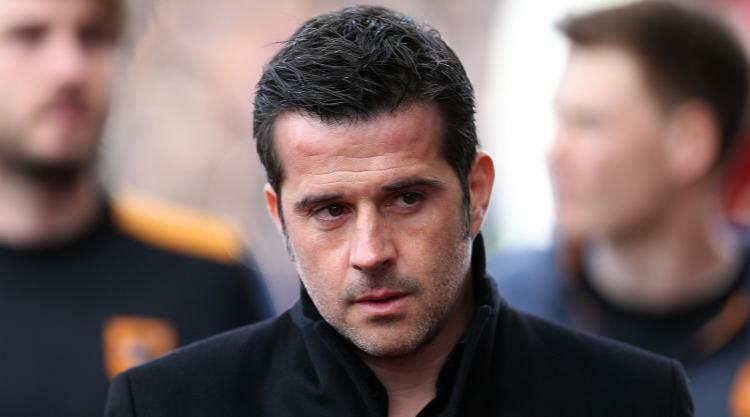 Hull head coach Marco Silva replaced midfielder Evandro with striker Abel Hernandez during the interval and it soon became apparent his side would look to contain Watford and hit them on the break. Jakupovic kept out Etienne Capoue's goalbound shot with his feet and Jose Holebas' effort was blocked by Andrew Robertson. But Silva's men swept forward in some style to take the lead in the 62nd minute. Kamil Grosicki was set free down the right and his fine cross was headed against the crossbar and down on to the goal line by Markovic, who followed up to shoot home the rebound. The KCOM erupted and the home fans had barely calmed down when Clucas smashed home Hull's second goal nine minutes later. Abdoulaye Doucoure's clearance from Grosicki's corner fell to Clucas 25 yards out and the midfielder unleashed a vicious, dipping drive beyond Watford goalkeeper Heurelho Gomes and into the top corner. Watford rarely troubled Jakupovic after Hull's second goal. Substitute Isaac Success' shot was blocked by N'Diaye but it would have taken something special to beat the Tigers' rearguard as they kept a clean sheet and secured another crucial victory.